The Pittsburgh Tribune-Review, also known as "the Trib," is the second largest daily newspaper serving metropolitan Pittsburgh, Pennsylvania, in the United States. Although it transitioned to an all-digital format on December 1, 2016, it remains the second largest daily in the state, amassing nearly one million unique page views a month. Founded on August 22, 1811, as the Greensburg Gazette and in 1889 consolidated with several papers into the Greensburg Tribune-Review, the paper circulated only in the eastern suburban counties of Westmoreland and parts of Indiana and Fayette until May 1992, when it began serving all of the Pittsburgh metropolitan area after a strike at the two Pittsburgh dailies, the Pittsburgh Post-Gazette and Pittsburgh Press, deprived the city of a newspaper for several months. The Tribune-Review Publishing Company was owned by Richard Mellon Scaife, an heir to the Mellon banking, oil, and aluminum fortune, until his death in July 2014. Scaife was a major funder of conservative organizations, including the Arkansas Project. Accordingly, the Tribune-Review has maintained a conservative editorial stance, contrasting with the more centrist Post-Gazette. In addition to its flagship paper, the company publishes 17 weekly community newspapers, the Pittsburgh Pennysaver, as well as TribLive.com and TribTotalMedia.com. The paper began as the Gazette on August 22, 1811. After a series of name changes and mergers it became the Greensburg Daily Tribune in 1889. In 1924, it and the Greensburg Morning Review, launched by David J. Berry in 1903, consolidated their interests under a single ownership. Both papers continued separate publication until 1955, when they merged to form the Greensburg Tribune-Review. Scaife bought the Tribune-Review in 1970. Scaife was a decade early in trying to unarm the Post-Gazette. In 1981–82, he started a short-lived eastern suburbs paper, The Daily-Sunday Tribune. The Tribune-Review owns several "satellite" papers that insert or surround the regional publication with neighborhood specific stories. The Valley News Dispatch, of Pittsburgh suburbs Tarentum and New Kensington is one such satellite. Local journalism student John Filo worked for the publication while attending nearby Kent State University and served as the Valley News Dispatch's correspondent of the Kent State shootings. His photography that day has ascended to iconic status and won the paper its only Pulitzer Prize. During a newspaper strike that temporarily shut down the Post-Gazette and ultimately closed the Pittsburgh Press, Scaife launched the Pittsburgh Tribune-Review, an edition of the Greensburg-based Tribune-Review covering Allegheny County and Pittsburgh. Over time, it became a stand-alone newspaper headquartered on Pittsburgh's North Side. In 1997, Scaife added to his small collection of newspapers by purchasing The Daily Courier of Connellsville, the Leader Times of Kittanning and The Valley Independent of Monessen from Thomson Newspapers. In late 1997, Scaife's NewsWorks facility opened in the North Hills. In December 1997, the Tribune-Review company purchased the North Hills News Record, even though four months earlier, then-Trib president Ed Harrell told the Pittsburgh Business Times that the company was not interested in the News Record. Nine months after purchasing the North Hills News Record from Gannett Company, Tribune-Review Publishing Co. announced the paper would be merged with the Pittsburgh Trib. The News Record was most successful during the newspaper strike of the early 1990s. At its demise, the North Hills News Record had a daily circulation of more than 16,000, nearly 1,000 less than its circulation before the Trib bought it. In early 2000, the Trib announced the "News Record" name would retire after more than two years of a combined "Tribune-Review/North Hills News Record" banner. North Hills coverage would be wrapped into the Trib's neighborhoods section. In 2000, the Trib announced it would convert its Irwin-based paper, the daily (except Sunday) Standard Observer, into a twice-weekly regional section of the Greensburg Tribune-Review. Citing a "sagging economy", the Trib laid off more than four percent of its workforce in 2003, including freelance writers. More shakeups continued in 2005 as circulation numbers dropped and a top official left. An online message board featured back and forth fights between Pittsburgh and Greensburg employees. Edward Harrell, then-president of the Tribune Review Publishing Company, announced in January 2005 that most of the regional editions of the paper would have their newsroom, management and circulation departments merged and staff reductions would follow. The merged papers include the Tribune-Review of Greensburg, the Valley News Dispatch of Tarentum, The Leader-Times of Kittanning, The Daily Courier of Connellsville and the Blairsville Dispatch. The Valley Independent, the only paper with a unionized newsroom and contract, was not affected. The company incorporated as Trib Total Media in the summer of 2005, and purchased Gateway Newspapers, a community publication group servicing approximately 22 communities, at the time, in and around Pittsburgh's Allegheny County. Two managers were immediately laid off. The exact number of proposed redundancies was not announced. In September 2005, Harrell announced his retirement as president of Tribune-Review Publishing Company, effective December 31, 2005. He had served as president since 1989. Several staff writers were laid off in December 2005 as two of Gateway's newspapers were discontinued. In May 2008, the Post-Gazette and the Trib reached a deal for one company to deliver both papers. The Post-Gazette would begin delivering the Trib to most of the area with some exceptions. Terms of the deal were not disclosed. On June 20, 2008, Trib Total Media publicly announced it was closing several weekly newspapers in the Gateway Newspapers chain. The papers affected include: Bridgeville Area News, North Journal, McKnight Journal, Woodland Progress, Penn Hills Progress, Coraopolis-Moon Record and the Advance Leader. Many of those papers were several decades old. The company also announced major changes to the remaining Gateway publications including a revamp of the Pennysaver in the communities that have Gateway newspapers. Several published reports say the remaining community newspapers would expand coverage to include areas no longer serviced by Gateway publications. The communities served by those titles will now be served by other Gateway newspapers. In November, 2015, Trib Total Media announced that they would be cutting back on home delivery of printed newspapers and emphasize digital delivery. The restructuring included the sale of two dailies and six weeklies to West Penn Media. Two papers were closed, The Daily News in McKeesport, and The Valley Independent in Monessen. The remaining papers, in Pittsburgh, Greensburg and Tarentum, became regional editions of a single title, the Tribune-Review. Home delivery was reduced in some parts of Allegheny and Westmoreland counties. Trib Total Media laid off 153 full and part-time workers from its staff of approximately 1,100, another 68 had accepted buyouts in October. The Pittsburgh edition of the Tribune-Review went "all-digital" after it published its last print edition on November 30, 2016. The Greensburg-based Westmoreland edition and the Tarentum-based Valley News Dispatch edition remained in print. Carl Prine, an investigative reporter for the newspaper, conducted a probe with the CBS news magazine 60 Minutes that highlighted the lack of security at the nation's most dangerous chemical plants following the September 11, 2001 attacks. The reporters, and a CBS camera operator, were charged with trespassing at a Neville Island plant during their investigation. They were later acquitted when the judge accepted that the story had been in the public interest. In 2007, Prine's further investigation into the subject was featured in the PBS documentary series Exposé: America's Investigative Reports, in a two-part episode titled "Think Like A Terrorist." One Tribune-Review flap went national when Colin McNickle, then editor of the newspaper's editorial page, attended a July 26, 2004 speech at the Massachusetts State House given by Teresa Heinz Kerry, who had been the subject of two negative articles in the Tribune-Review's opinion pages. After the speech, there was a dispute between McNickle and Heinz Kerry over her use of the term "un-American activity." 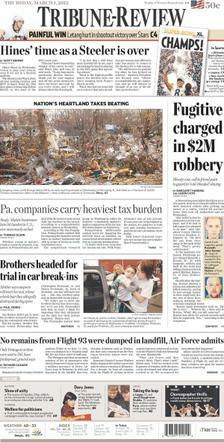 The daily Tribune-Review is published in three geographic editions: Pittsburgh, Westmoreland and Valley News Dispatch. The Tribune-Review claimed to show the highest gains in readership over the past five years of any newspaper in America's top 48 markets, which were dominated by sinking readership. The growth can be attributed to purchases of other newspapers which were then reclassified as editions of the Tribune Review. According to surveys by International Demographics Inc., an independent media research firm in Houston, the number of Tribune-Review readers jumped 17.8 percent from 2007 to 2012. As part of the Trib Total Media conglomerate, the Tribune-Review has a news exchange partnerships with WPXI, Pittsburgh's NBC affiliate and until 2013, it was a sister publication to Pittsburgh's second-largest news radio station, KQV. Trib Total Media is the Official Newspaper of the Pittsburgh Pirates and the Pittsburgh Penguins (the latter of which Scaife was a co-founder in 1967) and has strong partnerships with many nonprofit and community businesses and organizations throughout Western Pennsylvania. ^ "United States Circulation averages for the six months ended: 9/30/2011". Audit Bureau of Circulations. 2011-09-30. Archived from the original on 2013-03-17. Retrieved 2012-03-19. ^ Dominic. "Westmoreland County Newspapers". noel.mcn.org. Archived from the original on 10 March 2017. Retrieved 18 March 2018. ^ "Pittsburgh Tribune-Review Help Desk - Pittsburgh Tribune-Review". pittsburghlive.com. Archived from the original on 31 March 2010. Retrieved 18 March 2018. ^ Halllock, Steven M (2007). Editorial and Opinion. Greenwood Publishing Group. p. 135. ISBN 978-0-275-99330-6. Retrieved March 3, 2014. ^ Phillips, Jenn; Loriann Hoff Oberlin; Evan M. Pattak (March 1, 2005). Insiders' Guide to Pittsburgh (Third ed.). p. 441. ISBN 9780762735075. Retrieved March 3, 2014. ^ "Weekly Community Newspaper". Trib Total Media. Archived from the original on 13 March 2016. Retrieved 19 January 2016. ^ Walkinshaw, Lewis Clark (1939). Annals of Southwestern Pennsylvania. 3. New York: Lewis Historical Publishing Company, Inc. p. 435. Archived from the original on 2014-04-27. ^ a b "To Our Readers". Greensburg Daily Tribune (City ed.). Greensburg, PA. 29 September 1955. p. 1 – via Google News Archive. ^ a b Tascarella, Patty (August 25, 1997). "War of words". Archived from the original on June 30, 2015. ^ Fitzpatrick, Dan (October 20, 1998). "Thomson to sell New Castle News". Pittsburgh Post-Gazette. Archived from the original on May 22, 2011. ^ a b Tascarella, Patty (September 22, 1997). "North Hills News Record apparently on the block". Archived from the original on August 10, 2009. ^ a b Fitzpatrick, Dan (September 11, 1998). "Tribune plans to merge papers". Pittsburgh Post-Gazette. Archived from the original on May 22, 2011. ^ Tascarella, Patty (November 2, 1998). "Trib pushes North Hills daily inside". Archived from the original on February 4, 2006. ^ "Business Briefs, 2/11/2000". Pittsburgh Post-Gazette. February 12, 2000. Archived from the original on May 22, 2011. ^ "Newspaper Cutting Back to Twice a Week". The Indiana Gazette. Indiana, PA. January 29, 2000. p. 4. ^ a b "Westmoreland Briefs, 11/06/03". Pittsburgh Post-Gazette. November 6, 2003. Archived from the original on May 22, 2011. ^ "Tribune-Review to reorganize papers - Pittsburgh Tribune-Review". pittsburghlive.com. Archived from the original on 4 April 2005. Retrieved 18 March 2018. ^ Roddy, Dennis B. (January 20, 2005). "Shakeup at the Tribune-Review; layoffs expected at all newspapers". Pittsburgh Post-Gazette. Archived from the original on December 3, 2005. ^ "Page not found – Editor & Publisher". editorandpublisher.com. Retrieved 18 March 2018. ^ "Post-Gazette reaches deal to distribute Trib". Pittsburgh Post-Gazette. May 29, 2008. Archived from the original on June 1, 2008. ^ "Tribune-Review closing 7 weekly papers". Pittsburgh Post-Gazette. June 20, 2008. Archived from the original on May 22, 2011. ^ "Trib to cease publication of 7 weekly newspapers - Pittsburgh Tribune-Review". pittsburghlive.com. Archived from the original on 3 February 2009. Retrieved 18 March 2018. ^ Schooley, Tim (June 23, 2008). "Communities notified that seven Pittsburgh-area weekly newspapers will close". Archived from the original on May 26, 2011. ^ a b The Tribune-Review (November 10, 2015). "Trib Total Media announces restructuring to emphasize digital future". Trib Total Media, Inc. Archived from the original on November 12, 2015. Retrieved January 6, 2015. ^ The Tribune-Review (October 16, 2015). "Trib Total Media finds Pa. buyer for daily newspapers in Kittanning, Connellsville, 6 weeklies". Trib Total Media, Inc. Archived from the original on January 1, 2016. Retrieved January 6, 2016. ^ a b Gannon, Joyce (December 16, 2015). "Trib Total Media says it will close McKeesport, Monessen newspapers". Pittsburgh Post-Gazette. PG Publishing Co., Inc. Archived from the original on December 19, 2015. Retrieved January 6, 2016. ^ Frazier, Carol Waterloo; Sisk, Jeffrey (December 31, 2015). "Daily News thanks Mon Valley, publishes final edition after 131 years". Trib Total Media, Inc. Archived from the original on January 6, 2016. Retrieved January 6, 2016. ^ Paglia, Ron. "After 113 years, The Valley Independent prints final edition". Trib Total Media, Inc. Archived from the original on January 6, 2016. Retrieved January 6, 2016. ^ Gannon, Joyce (September 28, 2016). "Trib Total Media to drop print edition in Pittsburgh". Pittsburgh Post-Gazette. Archived from the original on October 5, 2017. Retrieved October 3, 2017. ^ "Pittsburgh Tribune-Review prints last paper; over 100 laid off". WTAE.com. Associated Press. November 30, 2016. Archived from the original on October 5, 2017. Retrieved October 3, 2017. ^ "U.S. Plants: Open To Terrorists". CBS News. November 13, 2003. Archived from the original on February 16, 2005. ^ "Journalists cited for trespassing at Neville Island chemical plant". Pittsburgh Post-Gazette. October 2, 2003. Archived from the original on June 28, 2011. ^ Olson, Thomas. "Trib shows most readership gains in U.S." TribLIVE.com. Archived from the original on 19 March 2018. Retrieved 18 March 2018. The Steelers entered the season as defending champions of the AFC North Division, coming off a 10–6 record in 2007. Based on the previous season's results, the team faced the most difficult schedule in over 30 years; however, they were called Super Bowl contenders by ESPN. The Steelers opened their regular season on September 7, with a win over the Houston Texans en route to a 12–4 record, and a second straight AFC North Division title. In his second season as head coach Mike Tomlin was selected in fan balloting as the Motorola Coach of the Year. Linebacker James Harrison was named the NFL's Defensive Player of the Year after leading a defense which set the standard for the league in nearly every defensive category, including total yardage allowed, points allowed, passing yardage allowed, first downs allowed, yards per play, and yards per pass, among others. The playoffs began on January 11, 2009, with a win over the San Diego Chargers. The following week saw the third victory of the season over the Baltimore Ravens in the AFC Championship game and the advancement to Super Bowl XLIII where the Steelers defeated the Arizona Cardinals on February 1, 2009. William “Bill” Viola Jr. (born April 9, 1977) is an international martial arts champion, promoter and author. He is the producer and founder of the Pittsburgh, Pennsylvania based Kumite Classic. Brad Bumsted is a prominent journalist in Pennsylvania. Until 2016, he worked for the Pittsburgh Tribune-Review. He is noted for writing "reform-minded stories" about the Pennsylvania General Assembly.In 2005, he was named one of "Pennsylvania's Most Influential Reporters" by the Pennsylvania political news website PoliticsPA. In 2008, the political website PolitickerPA.com named him one of the "Most Powerful Political Reporters" in Pennsylvania. The Pennsylvania Report named him to the 2009 "The Pennsylvania Report 100" list of influential figures in Pennsylvania politics and described him as a "mainstay in the halls of the capitol." Carl Prine (born November 3, 1966) is a military investigative reporter for the Pittsburgh Tribune-Review, who has been involved in a number of investigations into the security of various US facilities. While working with a reporter from 60 Minutes, he helped in the production of a television special that investigated the failings of security at US chemical plants, which received national attention from the media and the government. Subsequently, he re-enlisted in the military for a tour in Iraq. Cyril Harrison Wecht (born March 20, 1931) is an American forensic pathologist. He has been a consultant in numerous high-profile cases, but is perhaps best known for his criticism of the Warren Commission's findings concerning the assassination of John F. Kennedy. He has been the president of both the American Academy of Forensic Science and the American College of Legal Medicine, and currently heads the board of trustees of the American Board of Legal Medicine. He served as County Commissioner and Allegheny County Coroner and Medical Examiner serving the Pittsburgh metropolitan area. Heinz Field is a stadium located in the North Shore neighborhood of Pittsburgh, Pennsylvania, United States. It primarily serves as the home to the Pittsburgh Steelers of the National Football League (NFL) and the Pittsburgh Panthers of the National Collegiate Athletic Association (NCAA). The stadium opened in 2001, after the controlled implosion of the teams' previous stadium, Three Rivers Stadium. The stadium is named for the locally based H. J. Heinz Company, which purchased the naming rights in 2001. It hosted the 2011 NHL Winter Classic between the Pittsburgh Penguins and Washington Capitals on January 1, 2011. On September 10, 2016, it hosted the Keystone Classic, which featured a renewal of the Penn State-Pitt football rivalry, setting a new attendance record at 69,983 people. In 2017 it hosted the Coors Light Stadium Series game featuring the Pittsburgh Penguins and Philadelphia Flyers. Funded in conjunction with PNC Park and the David L. Lawrence Convention Center, the $281 million (equivalent to $397.60 million in 2018) stadium stands along the Ohio River, on the Northside of Pittsburgh in the North Shore neighborhood. The stadium was designed with the city of Pittsburgh's history of steel production in mind, which led to the inclusion of 12,000 tons of steel into construction. Ground for the stadium was broken in June 1999 and the first football game was hosted in September 2001. The stadium's natural grass surface has been criticized throughout its history, but Steelers ownership has kept the grass after lobbying from players and coaches. Attendance for the 68,400 seat stadium has sold out for every Steelers home game, a streak which dates back to 1972 (a year before local telecasts of sold out home games were permitted in the NFL). A collection of memorabilia from the Steelers and Panthers of the past can be found in the Great Hall. Mary Beth Buchanan, née Kotcella, (born July 25, 1963), is the former United States Attorney for the Western District of Pennsylvania. She was nominated by George W. Bush on September 5, 2001, and confirmed by the United States Senate on September 14, 2001. Buchanan was the first woman and youngest person ever in Pennsylvania's history to be appointed to this position, and she has been viewed by some, such as former U.S. Attorney General Richard Thornburgh and former U.S. Attorney Fred Thieman, as one of the more controversial U.S. Attorneys in the history of Pennsylvania. Under Attorneys General John Ashcroft and Alberto Gonzales, Buchanan continuously held two key Justice Department posts, splitting time between Washington, D.C. and Pittsburgh up until her resignation as Acting Director of the Department of Justice's Office on Violence Against Women in December 2007. In May 2010, Buchanan, a candidate for the U.S. House of Representatives in Pennsylvania's 4th congressional district, was defeated in the Republican primary. Pittsburgh is home to the first commercial radio station in the United States, KDKA 1020AM; the first community-sponsored television station in the United States, WQED 13; the first "networked" television station and the first station in the country to broadcast 24 hours a day, 7 days a week, KDKA 2; and the first newspaper published west of the Allegheny Mountains, the Pittsburgh Post-Gazette. Until 2016 Pittsburgh was one of the few mid-sized metropolitan areas in the U.S. with two major daily papers; both the Pittsburgh Post-Gazette and the Pittsburgh Tribune-Review have histories of breaking in-depth investigative news stories on a national scale. In 2016, the Tribune-Review moved to an all-digital format. In 2018, the Post-Gazette moved to publishing five print editions a week. The alternative papers in the region include the Pittsburgh City Paper; The Jewish Chronicle of Pittsburgh; The New People, published weekly by the Thomas Merton Center for Peace and Social Justice; the New Pittsburgh Courier, one of the larger ethnic publications in the region; and Zajedničar, the only Croatian-language newspaper currently published in the United States. The Pitt News, a financially independent student-written and -managed newspaper of the University of Pittsburgh, is closing in on its 100th year of publication. The University of Pittsburgh School of Law also hosts JURIST, the world's only university-based legal news service. Outdoor advertising in the area is handled by Lamar Outdoor, who controls a majority of large posters and billboards and bus shelters (including Downtown Pittsburgh) and shopping centers in the area. The Oakland Zoo is the student cheering section for the University of Pittsburgh men's and women's basketball teams. The Zoo cheers on the Panthers from the bottom tier of the stands at the Petersen Events Center, primarily across from the teams' benches and on the baselines under the baskets. The "Pete" holds a rowdy crowd of 1,500 students that are typically uniformly clad in gold t-shirts, and the Zoo student section is consistently sold out for Panthers home games. The Oakland Zoo is named after Oakland, the neighborhood in which the university is located. The name "Oakland Zoo" is used for the basketball cheering sections only; the football cheering section has often used the title, "The Panther Pitt." PPG Paints Arena is a multi-purpose indoor arena in Pittsburgh, Pennsylvania that serves as home to the Pittsburgh Penguins of the National Hockey League (NHL), and was the home of the Pittsburgh Power of the Arena Football League (AFL) from 2011 to 2014. Construction was completed on August 1, 2010, and the arena opened in time for the 2010–11 NHL season. It replaced the Penguins' former arena, Civic Arena (formerly known as Mellon Arena), which was completed in 1961. A ceremonial ground-breaking was held on August 14, 2008. The arena is the first Leadership in Energy and Environmental Design (LEED) gold-certified arena in both the NHL and AFL. Soon after the arena opened in 2010 it was named "Best New Major Concert Venue" in the Pollstar Concert Industry Awards and "Best NHL Arena" in the Sports Business Journal reader poll. The arena was originally named Consol Energy Center (CEC) after Consol Energy purchased the naming rights in December 2008. The current name comes from Pittsburgh-based PPG Industries, who purchased naming rights in October 2016. Pittsburgh Magazine is a lifestyle magazine covering the Pittsburgh metropolitan area. It has a monthly readership of 341,274. It produces the annual "40 Under 40" list of prominent young Pittsburghers in addition to the annual list of Pittsburgh's 25 Best Restaurants, Best of the 'Burgh, Top Doctors, Top Dentists and annual City Guide. It is a member of the City and Regional Magazine Association (CRMA).The magazine was purchased in 1970 by WQED, who used the magazine as part of its pledge drives. By 1978, it was still losing money, but it had gained tax-exempt status through WQED. Allies of Richard Mellon Scaife, the owner of the rival Pittsburgh Tribune-Review and the Pittsburgher, investigated the financial status, with a possible eye toward challenging the tax-exempt status. In 1983, the magazine was drawn into a battle between staff members regarding WQED's involvement with Nancy Reagan's anti-drug campaign. In 1990, the magazine was the subject of a libel lawsuit brought by two police officers after publishing an article about the disappearance of a Pittsburgh man; the suit was settled for $75,000.Amid significant staff turnover, former employees suggested that the growth of the magazine was stunted by its relationship with the financially distressed WQED. In October 1993, Sewickley native Christopher E. Fletcher was hired as editor. The magazine underwent a significant format re-design in 1994.In 2009, the magazine was purchased by WiesnerMedia, a suburban Denver-based publishing company. A short time later, the offices were moved out of WQED's Oakland headquarters to new facilities on Washington's Landing.In January 2010, the magazine launched its World Wide Web home: PittsburghMagazine.com, which includes daily and weekly blogs and e-media. Pittsburgh Opera is an American opera company based in Pittsburgh, Pennsylvania. Pittsburgh Opera gives performances in several venues, primarily at the Benedum Center, with other performances at the Pittsburgh Creative and Performing Arts School (CAPA) Theater. Pittsburgh Opera headquarters is located in the former George Westinghouse Air Brake Factory, 2425 Liberty Avenue, in the Strip District. Pittsburgh Opera has been awarded LEED Silver Certification by the U.S. Green Building Council and is the first "green" opera company in the U.S. in the Operations and Maintenance Category. Pittsburgh Opera's headquarters is also the oldest green building in Pittsburgh. The Politicker Network, or Politicker.com, was a national network of fifty state-based political websites operated by the New York Observer. Randy Bish is an American editorial cartoonist working for the Pittsburgh Tribune-Review. He is the winner of the 2012 Clarion Award for Editorial Cartooning. He is the recipient of a Golden Quill Award and was a 2002 winner in the Iranian International Cartoon Contest.Bish began working for the Pittsburgh Tribune-Review in 1985, where he draws seven weekly cartoons. In addition to the Pittsburgh Tribune-Review, his editorial cartoons have appeared in the Orlando Sentinel, the 21st Century Business Herald in China, Reakja in Poland. News programs, including Good Morning America, Fox News, C-SPAN, and CNN Headline News, have used his editorial cartoons.His cartoons are syndicated by the Pennsylvania Newspaper Association and have been syndicated by United Media. Bish's cartoons have been published in Attack of the Political Cartoonists and The Best Political Cartoons of the Year 2005. His artwork was used for the cover of Best Editorial Cartoons of the Year in 1998.His artwork has been featured in several art gallery exhibits, including the Charles Schulz Museum, The California Museum for History, Women and the Arts, Newseum, and Mount Vernon. Richard Mellon Scaife (; July 3, 1932 – July 4, 2014) was an American billionaire, a principal heir to the Mellon banking, oil, and aluminum fortune, and the owner and publisher of the Pittsburgh Tribune-Review. In 2005, Scaife was number 238 on the Forbes 400, with a personal fortune of $1.2 billion. By 2013, Scaife had dropped to number 371 on the listing, with a personal fortune of $1.4 billion. During his life, Scaife was known for his financial support of conservative public policy organizations over the past four decades. He provided support for conservative and libertarian causes in the United States, mostly through the private, nonprofit foundations he controlled: the Sarah Scaife Foundation, Carthage Foundation, and Allegheny Foundation, and until 2001, the Scaife Family Foundation, now controlled by his daughter Jennie and son David. Robert Nutting (born March 29, 1962 in Wheeling, West Virginia) is a businessman and sports team owner. He is currently Chairman of the Board and principal owner of the Pittsburgh Pirates, a Major League Baseball team. His other business activities include serving as CEO of Ogden Newspapers Inc. and owner of Seven Springs Mountain Resort. The Chief is a 2003 biographical one-man play about the Pittsburgh Steelers' founder and owner Art Rooney (1901–1988). The Pittsburgh Public Theater show has had several revivals since its inauguration, with each production performed by Pittsburgh native Tom Atkins. The Globe is a newspaper published by Point Park University in Pittsburgh, Pennsylvania. It was launched in 1967. Published once per week, the paper is written by student journalists. The Pittsburgh Tribune-Review noted in 2006 that The Globe successfully revealed the identity of two buildings that Point Park University was looking into buying, even though the terms of the deal were subject to a confidentiality agreement. In 2014, the Mayor of Pittsburgh selected then-editor of The Globe Andrew Goldstein for a question during a press meeting. Mayor Bill Peduto indicated he read The Globe regularly and praised its editorial from the same day of publication as his press conference. The Globe has received multiple forms of recognition from the Society of Professional Journalists. In 2013 it was recognized with 11 "Mark of Excellence Awards"; and the following year it received four from the same institution.